This is what you might call a dream project, a collaboration between Nike, Hush Studios (who I worked for) and Skylab to build three weather-proof buildings, completely transforming a football field into a world-class brand experience. 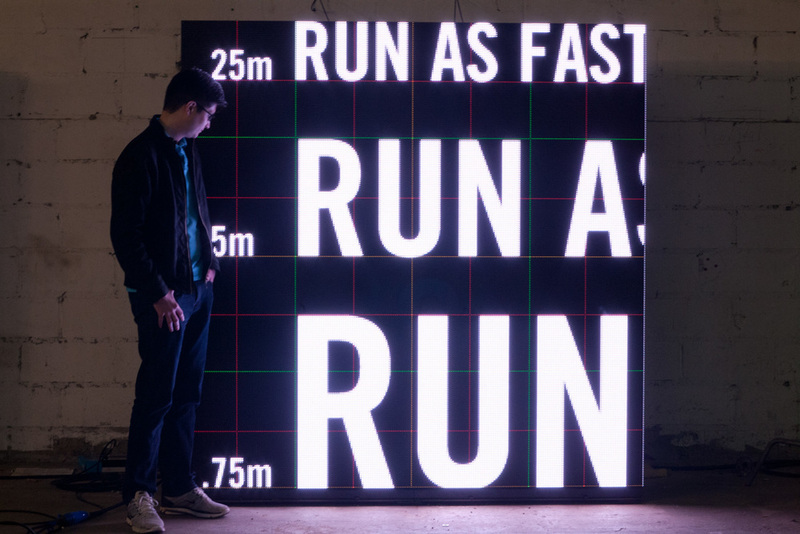 I worked on the Nike+ building, which included a life-size, two-person racing game. Using state-of-the-art Woodway treadmills, with no mechanically driven parts, the participants had to rely solely on their own strength and stamina in order to win. 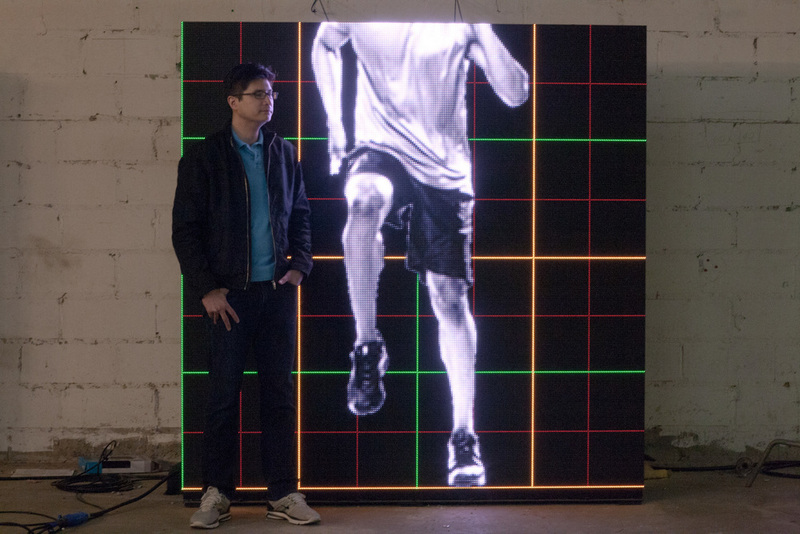 Once they were signed in and fitted with brand new Nike shoes in USATF colors, they stepped onto the treadmills, where a depth cameras recognized their figures and displayed a life-size pointillized avatar of each player. The players were then instructed to start running, and a colorful countdown began. 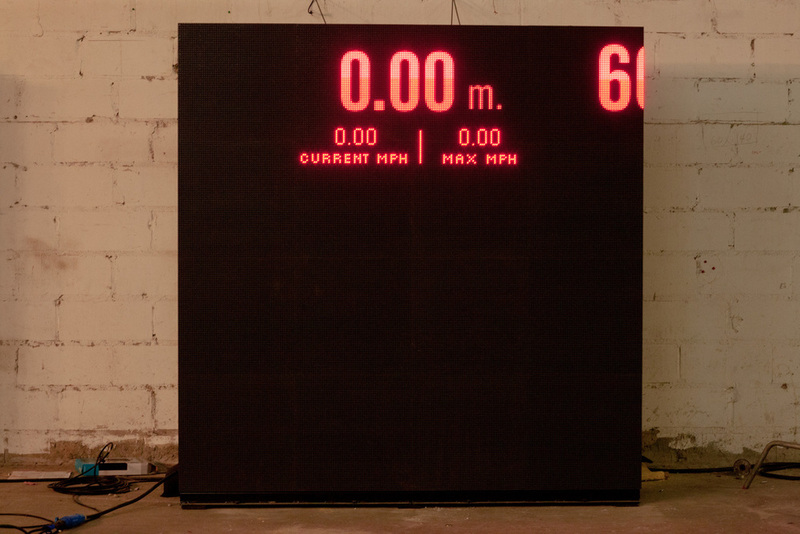 Once the game begins they have 30 seconds to run as far as they can (calculated down to the hundredth of a meter). To break 200 meters you have to be running at a 15 mph sprint and hold it for 30 seconds. By the end of the trials several runners came back again and again, nearly filling the entire leader board (displaying the top 15 runners) with 200+ meter distances. The leaderboard reset every day at midnight, giving participants a chance to try again the next day. The installation went on to travel the world to places such as Tokyo, and Moscow. Style frames, font design and previs. Animation tests, LED testing, full scale game testing, Interaction, on-site tweaks and management (at the US Olympic trials). Both Partners (David and Erik), the Creative Director (Jodi), Art Director (myself), a Producer, a Junior Producer, an Animator, and one Independent Creative Technologist. Nike Camp Victory- US olympic Trials. 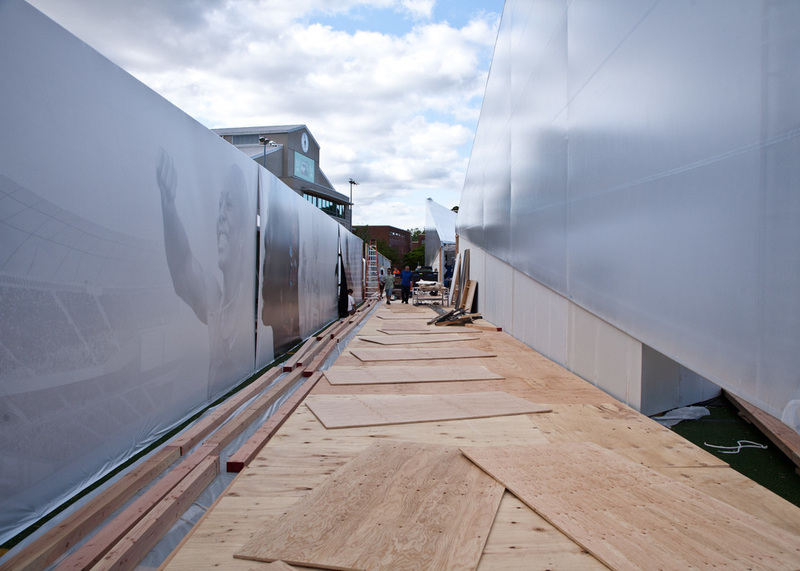 The building housing the Nike+ running game is the one on the right. Nike provided us with two human powered treadmills from Woodway. We designed the look of the interior in collaboration with Skylab. 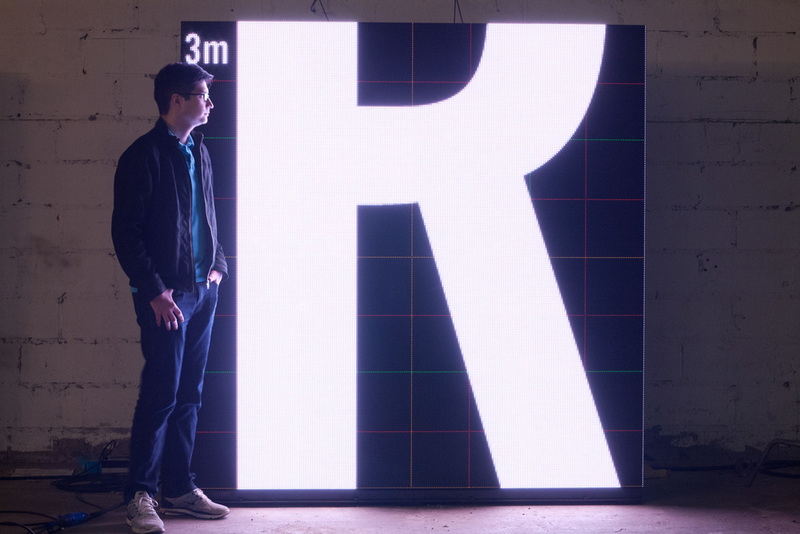 The black reflective floor, the resolution of the LED screen, and the content on the screen were all decisions that were made during the design process. The black areas to the right and left of the LED screen were originally going to also be LED, however by limiting the screen size we were able to afford a higher resolution LED matrix while at the same time trimming the budget. Each participate signs a wavier and is fitted with running shoes. They enter a user name, and have their photo taken. 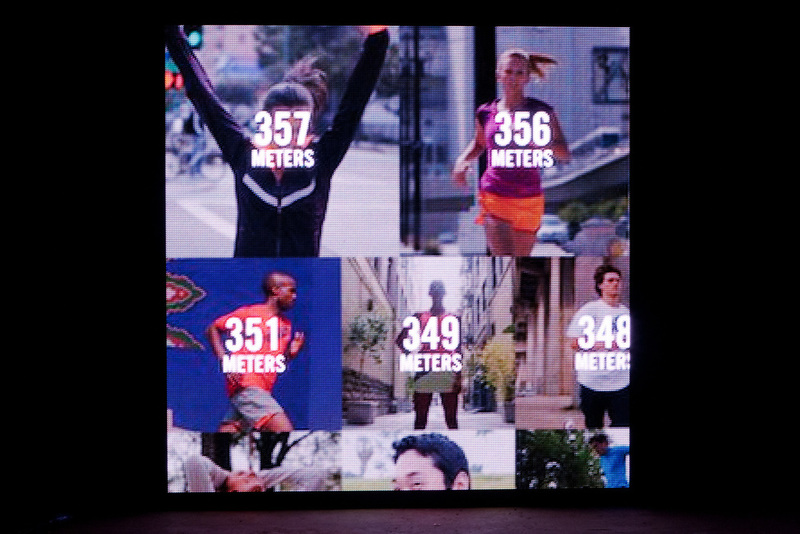 The moment they step on the treadmill their photo drops from the top of the screen with their name, and they are instructed to start running. A countdown begins with bold colors that radiant out from the center of the screen. 3, 2, 1, GO! 30 seconds to run as far as you can, measured down to the one hundredth of a meter. The faster you run, the more you level up, and the more you change the color of the room. Each time a player levels up the amount of particles, and the speed of the particles double until you have a solid wall of color. At the end of the race each the participant's score is posted, along with a trophy. The size of the trophy is determined by the distance. In this example both runners received the maximum trophy size. They also see a graph of their run. 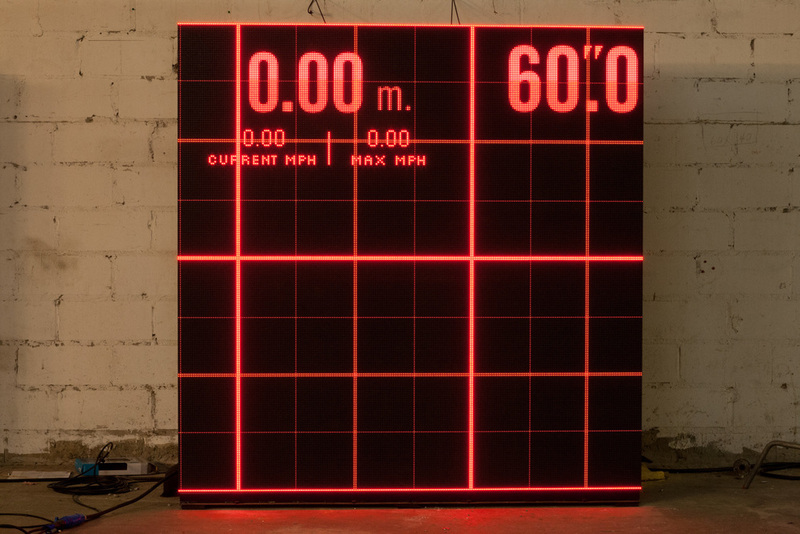 This gives each runner individualized feedback about their speed throughout the race. This was a critical component for helping players to learn from their experience and to help them strategize for the next race. This is the leader board featuring the top 15 runners for that day. It resets every day at midnight, giving people another chance the following day. To break 200 meters you have to be running at 15 mph when the game starts and hold that sprint for 30 seconds. By the end of the event, nearly all the top spots were over 200 meters. One high school athlete broke 220 meters and caught the eye of some people at Nike. These were some of the fastest track teams in the country. We even got a couple of olympic athletes to give it a try. 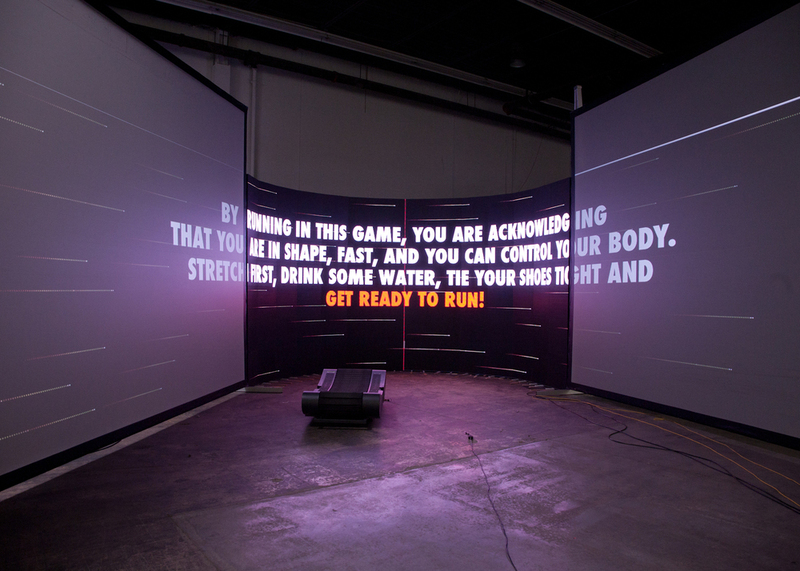 Between matches, the LED screen would cycle through a number of animated states including: A flyover of Eugene Oregon displaying popular running paths from real Nike + data, a scoreboard of participants along with their scores (regularly updated), and several motivational slogans and ambient designs. 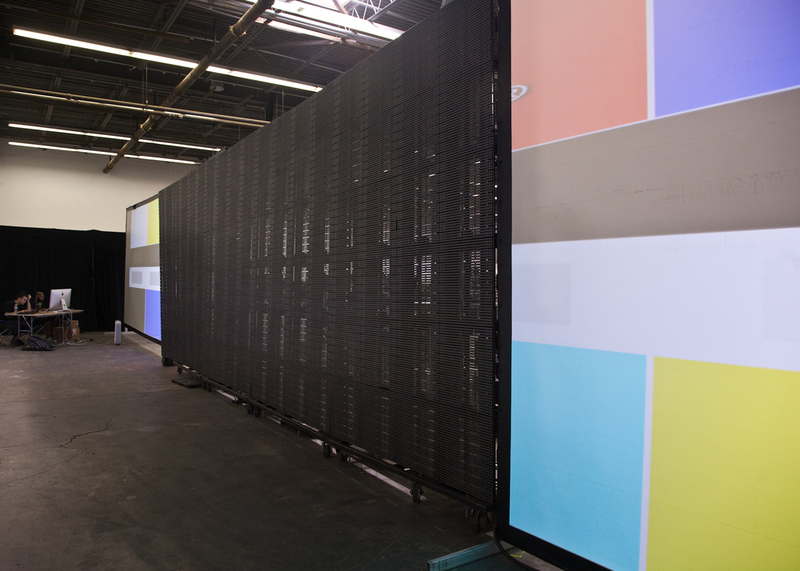 The first step of many, it was these boards that showed the client that we were up to the challenge of designing an entire game, on a 9x21 foot LED screen. Many design challenges followed, including on-site maintenance in Eugene Oregon, interaction with a real-time leader board, and integration of a retail space. Everything had to be thought through from the color and reflectively of the floor, to the brightness of the LED screens and sound design. I worked as Lead Designer, then as Art Director on the game portion of the project. It was a pleasure to work with the people of Hush, Skylab, Red Paper Heart, Ant Food, as well as the on-site personnel in Eugene. It was a massive project of which I was proud to play a small, but important role. The iPad app was programmed by Red Paper Heart and was essential for taking photos of participants, entering a racing names, and for controlling the game remotely. On-site documentation, pre-event testing and maintenance of the game throughout the event.